IBS affects millions of Americans. It is a condition affecting the lower digestive tract. Often the tract becomes inflamed which causes it to manifest upset stomach, excessive gas and bloating, cramps, constipation and mucus in the stool. It can be difficult to treat as it is chronic, and dependent on many lifestyle and dietary factors, not forgetting stress and anxiety. In this review, we look at a product formulated to enhance digestive health, the aptly named Health Digestive Health Daily Probiotic Capsules. These probiotic vegetarian capsules contain 10 billion cultures. When bad, invasive bacteria colonise the gut, it is one of the big causes of stomach and digestive ailments. Good bacteria needs to be planted in the digestive tract to aid normal digestion and nutrient uptake. 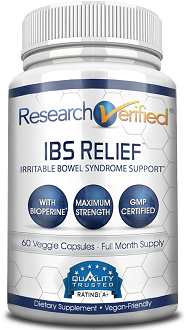 With healthy digestive functioning, comes an alleviation of IBS and related symptoms. This product is contains naturally sourced, clinically studied ingredients – one probiotic and one prebiotic – to restore good gut health. LGG has been the most clinically studied probiotic for its ability to promote good overall digestive health. 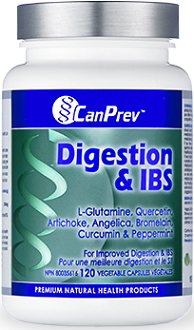 Prebiotics are necessary for probiotics to work well and form, which is why these capsules also contain inulin. The other ingredients are inactive and are used to make the capsules. The capsules are vegetarian-safe. 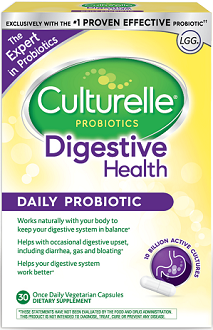 Culturelle claims to be the only brand containing 100% pure LGG, delivering a potent dose of this strand of probiotic. Together, these ingredients should also greatly boost immunity. The digestive tract also influences brain function, so a problem gut is thought to be synchronous with anxiety, for example. In turn, anxiety is thought to be a contributing factor in IBS flare-ups. This strain of probiotic should go a long way to aiding most people. Everyone has a difference base probiotic make up in their gut, so it is hard to tell which strands you are deficient in and which ones you need to supplement. Take 1 capsule daily but two capsules – one in the morning and one at night – if the symptoms flare up. Do the same if you are traveling, preferably starting 3 days before your trip. Only proceed on the advice of a medical practitioner if your immunity is compromised. Not suitable for children under 12. You may experience mild bloating and gas or a change in bowel movements at first, which is due to the changing conditions in the gut. See a doctor if you experience this side effect for more than 14 days. Culturelle is dairy free but made in a factory processing dairy. Some people see an improvement in their IBS in as little as 2 days, but it varies from person to person. A bottle of 30 capsules will cost you $15.35 on Amazon. This is a one-month or two-week’s supply, depending on your symptoms. You must submit your return – an unused or open bottle – within 90 days. First, you need to ask the store of purchase origin for a refund and then claim it from the manufacturer should the store not provide you with any. There is paperwork to be submitted and a process to follow. You may return a maximum of 2 bottles. 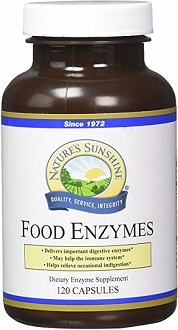 This product contains the most LGG, a probiotic known to improve overall digestive health. Without probiotics, the gut is overrun by bad bacteria and cannot digest food properly, or take up nutrients into the bloodstream. This adversely affects not only gut and bowel health, but overall immunity and health. The inclusion of a prebiotic is important as this is necessary for optimal probiotic functioning. Consumer reviews for these capsules are generally good, but with probiotics you should always bear in mind that results will differ from person to person. If you’re looking for a complete IBS-fighting remedy, one with a dual action is best. Probiotics are an important factor in the IBS equation, but so is the actual inflammation of the digestive tract. Take herbal remedies known to soothe and clear up the lining of the tract itself, or look for products that contain this in their formula.